And we called both decades ago! Autos are the last splurge for aging Baby Boomers. Their kids leave the nest and finally the parents can buy the car they wanted, not that damned minivan to taxi kids around. But as we age, we don’t drive nearly as much and those luxury or mid-life-crisis sports cars last a long time. 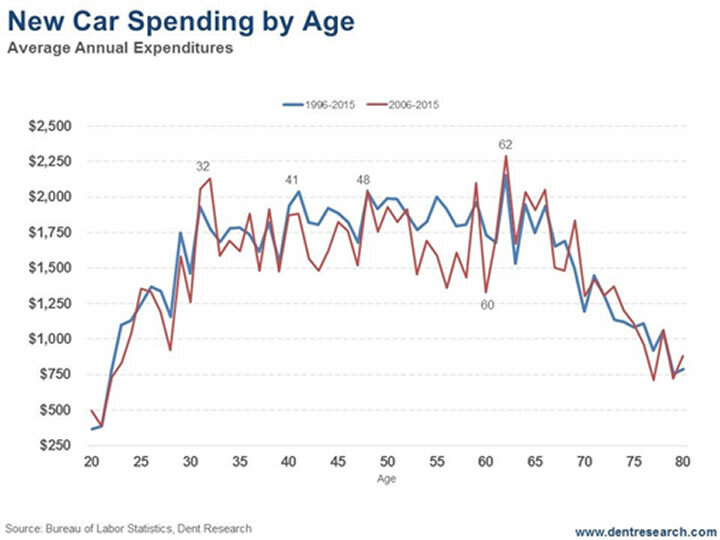 So, even though Baby Boomers followed the pattern and bought better cars, they rebuy as often, which causes a decline in auto spending, especially after age 48. We just recently got updated data from the Consumer Expenditures Survey. This allows us to predict not only the broader economy in human life cycle spending, but every consumer sector as well. Our previous data suggested that new car sales would peak around age 53 to 54. The new data, from 1996 – 2015 (blue line in the chart), and more recently from 2006 – 2015 (red line) says that auto sales peak closer to age 48 – earlier than we previously thought – and then continue sideways before surging one last time around age 62. Then it’s straight downhill from there. Notably, car sales first collapse between age 51 and 60. Guess where the bulk of the Baby Boomers are heading! Auto sales first surge into around age 32, along with first-home buying. They peak around age 41, again, along with trade-up home buying. Then they have another surge into around age 48, as their kids leave the nest and they buy the luxury Lexus or sports car that they really wanted (as I said earlier). But then they don’t drive it nearly as much as they previously spent their time driving around their kids from school to soccer practice to “ecstasy” parties… or whatever. So that “best car” lasts for 10 or more years instead of four years for the typical soccer mom. Now the new data shows there’s a final surge into the early 60s, before people retire. The truth is that car sales tend to plateau between 32 and 62 and lean towards the higher-end sectors, with the sharpest decline between age 51 and 56. What has kept car sales going after they should have peaked around 2012? The same thing keeping our economy going: QE or near-free money and lower interest rates. Did they learn nothing from the last subprime crisis? Total loans for autos are much higher than they were into 2007, and growing exponentially. 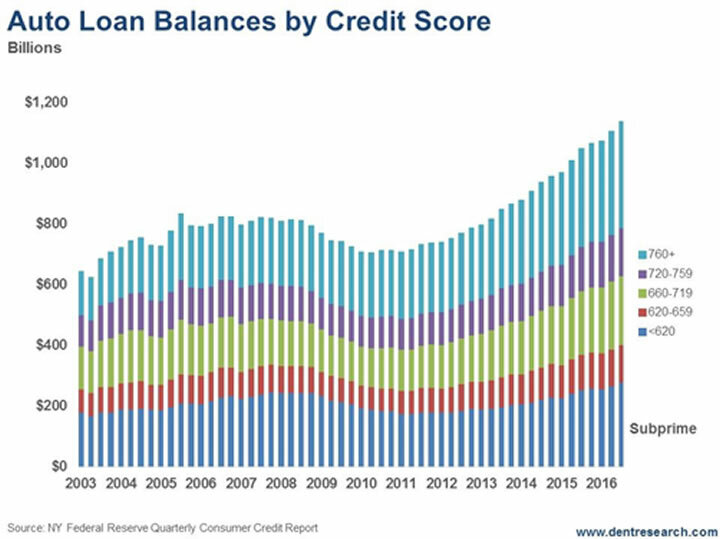 Subprime loans, at the lowest credit ratings, are now at $280 billion and rising. In 2007, they reached only $205 billion. When you add in the next red zone of near-subprime borrowers, it’s $405 billion! , it’s the stink of defaults and a worsening downturn in auto sales coming! Car inventories are piling up on the borders of Mexico. Manufacturers are trying to hide their growing inventories. GM plans to extend its typical summer shutdown at certain U.S. factories to deal with slumping sales and its bloated inventory. In fact, car sales were down 0.5% in May, part of a five-month decline. The experts keep guessing things will improve and have been wrong. They don’t understand that demographic trends are going against this last durable goods market to peak after housing and furniture. And they don’t understand how much this sector has been hyped up by liberal lending, like housing was into early 2006. Two very smart investors, Buffett and Soros, invested in major retail auto chains in the last few years… we could have told them not to bother.